Yes, there are balconies at Palazzo Victoria, the recently opened 71-room luxury hotel in Verona, Italy, the city famous for being the setting of Shakespeare's enduringly romantic Romeo & Juliet. Located in northern Italy's Veneto region, about halfway between Venice and Milan, Verona is a wonderful spot to spend a night or two absorbing the literary legacy of the Capulets and Montagues (said to be inspired by actual families and a real young couple – read on for details) as well as a revolving calendar of operas and concerts in the striking Arena di Verona, a Roman amphitheater that dates to the 1st century. Palazzo Victoria, which opened in late March as part of the Salviatino Collection (its first property is the hilltop Il Salviatino in Florence), is located in a 14th-century building set atop Roman and Medieval ruins (some of which are incorporated into the public spaces) within the city’s ancient Roman walls. Accommodations are in four categories, ranging from Deluxe Rooms (shown at left) to distinctive Victoria Suites, and feature high ceilings and Veronese decor such as mahogany furniture, fabric wall coverings, and hand-made linens. Some have balconies, original frescoes, and parquet floors. The hotel also features the casual-chic Brasserie of Palazzo Victoria, serving contemporary Italian regional cuisine created by Chef Carmine Calo, with a menu that changes daily and al fresco seating in the courtyard in season. There’s also a Lobby Lounge with a Wine Bar and Champagnerie. Verona, which I visited in May for the first time, is vibrant and welcoming, with wonderfully preserved architecture ranging from ancient Roman walls to stunning Renaissance palaces. Its walled center is a UNESCO World Heritage Site and its showpiece is its 2,000-year-old Arena, situated on Piazza Bra’, which is the third largest Roman amphitheater in Italy. In summer it comes to life with a series of concerts and performances. 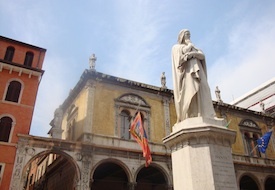 The city’s squares are also lively and photogenic, especially Piazza dei Signori, dominated by a statue of Italian poet and writer Dante Alighieri (shown at right), who lived here in the early 14th century, and the nearby Lamberti Tower, Piazza Delle Erbe, and the elaborate tombs of the Della Scala family in the Arche Scaligere. 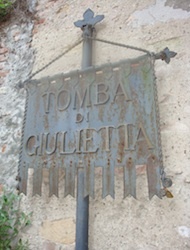 Shakespeare fans and romantics can visit a trio of sites linked to the star-crossed lovers Romeo and Juliet, said to be based on the real life Romeo Montecchi and Giulietta Capuleti, whose residences you can visit. I have to admit that Juliet’s House, easily located at 23 Via Capello because it is mobbed with tourists (many of them students), was a shock: Almost every reachable inch of the 13th-century walls in the entryway and courtyard is covered with graffiti (mostly names and initials of hopeful young couples encircled by hearts). 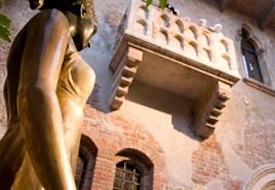 And while the interior is worth a visit (it was restored in 1935 and recreates a typical 14th-century household), the star is the elegant bronze statue of Juliet by Nereo Costantini that stands in the courtyard (shown at left), where rubbing her right breast is said to offer good luck. 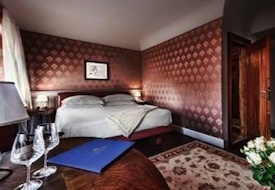 Palazzo Victoria is located off of Corso di Porta Bordari, a few blocks from the Roman Arena and near some of Verona’s best shopping; rooms start at $290/night. See our Italy destination guide for more trip-planning information, then use our Travel Search price comparison tool to find the lowest rate on flights, hotels, cruises, and more travel deals.